Expose your students to the use of human genome sequencing data in medicine by allowing them to take on the role of clinical scientists. Students examine multiple pieces of evidence to determine whether a genetic variant is likely to cause a patient&apos;s symptoms. Students must support their claim using evidence and explain their reasoning. 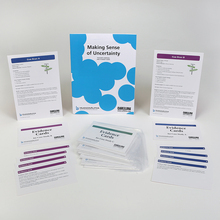 Kit is designed for a class of 30 students working in groups and includes a digital slide presentation and a script for guiding students through the activity. Expose your students to the use of human genome sequencing data in medicine by allowing them to take on the role of clinical scientists. Students examine multiple pieces of evidence to determine whether a genetic variant is likely to cause a patient&apos;s symptoms. Students must support their claim using evidence and explain their reasoning. Each student group is assigned 1 of 5 case studies that describes the patient&apos;s symptoms, family history, past genetic testing, and the genetic variant of interest. Accompanying each case study are 9 evidence cards, each of which contains a different piece of information about the variant.